Growing up in a homeschool family, my early history lessons were largely self-directed. Meaning that I chose the time period, or the history that I wanted to learn, and then had free reign to find any and all books related to it that I could. This often included factual books, fantasy books, and all books in between. One of my favorite time periods to study, due to the myths and speculation surrounding it, is that of the early history of Great Britain, namely the time of King Arthur. In factual history, King Arthur was sometime between when the Romans abandoned Britain, and when the Saxons showed up. A time of rough fighting and rougher arms, not the picture of mail-clad chivalry that is normally portrayed in the myths and legends. Lawhead’s series “The Pendragon Cycle” investigates this fascinating time period in great detail. Using more Celtic and Bardic mythologies, Taliesin for example, and even drawing in the lost city of Atlantis, Lawhead weaves a compelling and fascinating tale. Each of the books in the Pendragon Cycle focuses on one or two people. A girl of Atlantis and Taliesin the bard, Merlin son of Taliesin, Arthur, and later some of his knights, all have their focus. These tales are clean reading, with only a few darker sections that might be difficult for tween readers. I read these books around when I was 12 or 13, I have not read some of Lawhead’s more recent books (like the ones about Robin Hood, though I’ve heard they are good as well). While my reading was focusing on the mythology of Arthur Pendragon, the added layers of Atlantis and Bardic tradition, where very fascinating. The Pendragon Cycle is a long series, but well worth reading for anyone interested in the history of Britain, shrouded in myth. Of course, how much of the Arthurian tales are myth, as opposed to truth, one can never really know. Lawhead’s presentation of these tales, however, leaves nothing wanting. They are fascinating, engaging, and well worth reading. Lawhead’s books are Christian Fantasy. However, they are focused more on the Catholic side of things as opposed to the Protestant side. This works fine with The Pendragon Cycle, as at this time the divisions were not yet well marked and most of the Arthurian legends were maintained in the Catholic church and the legends of Chivalry that was propagated under them. Personally, I enjoyed the first two or three books in the Pendragon Cycle more than the final books in the series. However, I have often found that to be the case with longer series. I really enjoy the first few books, but after a bit the rest of the series just doesn’t seem to fulfill the promise of the other books. While I have less trouble with Lawhead’s books than with some, I still found that to be the case. However, it may also be due to the increase darkness and despair that creeps in, in the final books in the series. After all, the closer to the Holy Grail the Knights of the Round Table get, the harder the quest will be. Right? 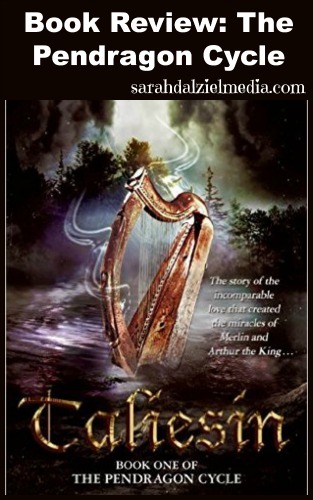 Also, as someone who really enjoys Bardic and Celtic mythology, the first three books were much more interesting than the later books which dealt more with Arthurian legends. Personally, I enjoy studying the history of the British Isles, as well as other ancient histories. History is fascinating particularly if you can find a good, and moderately accurate, historical fiction novel to study with. Personally, I highly recommend books by G. A. Henty, and R. M. Ballantyne. Their books are in the public domain, and can often be downloaded for free from Amazon, Gutenberg, and other sites. Henty deals more with the military conflicts that Britain was engaged in, while Ballantyne has more of a propensity for dealing with Christian conflicts and persecutions. For a good view of Britain at the time of the Roman Invasion, check out G. A. Henty’s “Beric the Briton” which covers the British resistance under Boadicea. Beric the Briton also gives a good view of Rome under Nero, the Christian persecution of that time, and the life of a renegade in the mountains of Italy. The book finishes off with a brief glimpse into the life of a British chieftain who is at peace with Rome. For the history of Britain later on, “The Dragon and The Raven,” also by Henty, covers the battles between the Saxons of Britain and the invading Danish Northmen. This book includes a pile and a half of battles by land and by sea, as well as an interesting view of the life of the Danes, as well as the Saxons. I have read this book at least six times, and still greatly enjoy both the story side of it, and the military strategy side. For the Norman Invasion of Britain, the book “Wulf the Saxon” is a good reference for how the Normans came to be kings of Britain and the battles surrounding that time. Henty includes the speculation, truth, and sometimes the downright sneakiness that was practiced by Norman and Saxon alike. The battles, at least, have plenty of interest and there is a good portrayal of life in that time. If you are more interested in the Crusades under Richard the Lion Heart, then “Winning His Spurs” or “The Boy Knight” will be another engaging read. This Crusade happened around the time that the Normans started feeling themselves English, and it is quite the interesting story. Including some Robin-Hood style moments, out-right brigandage, and good stout hard-hitting knightly contests. I enjoy and appreciate Henty’s books. However, as a writer Henty was not before his time and many of the expressions and statements used by Henty would now be considered supremely politically incorrect. Henty wrote before the “rewriting of history” and his impressions on people groups, actions, and other incidences are sometimes sharply at odds with what is taught in today’s schools. The same observations can also be applied to Ballantyne. However, a reader with a bit of understanding of Henty’s time would be well able to glean valuable historical information, as well as enjoyment, from the reading. The characters are often ahead of their own times and express opinions that, in those days, would have been completely un-thought of. Finally, the further back in history the novel is, the more like a novel it will read. When Henty dealt with more modern conflicts, such as the Penninsular war, he went largely into detail on the battles, defences, and all parts of the military conflict. Often having the main character go through the battle, and then having an entire chapter just dedicated to the military movements. A very good thing for understanding battles, not so good a thing for a relaxing read – however the war chapters are easily skimmed.